Fair is foul and foul is fair in this measured production of The Scottish Play. The staging is dark, gloomy, loud, and bloody. The three weird sisters are very weird, and that is a good thing. Plenty of fog, a few flames, and lots of foreboding drumming (a bit too much drumming) set the tone for an eerie self-fulfilling prophecy. Cackling, laughing, and scheming around the cauldron, Emma Slipp, Kate Besworth, and Harveen Sandhu steal the show and provide the mystical element to this Macbeth. Banquo (Craig Erickson) also stands out, especially as he ascends the stairs into the audience, talking to an imaginary dagger, and when he climbs up on the table to taunt Macbeth. There is a wild glint in his eyes. Lady Macbeth (Moya O’Connell) is passionately maniacal, and Macbeth (Ben Carlson) spirals methodically into madness. For the most part, this is a safe adaptation that doesn’t veer far from tradition. 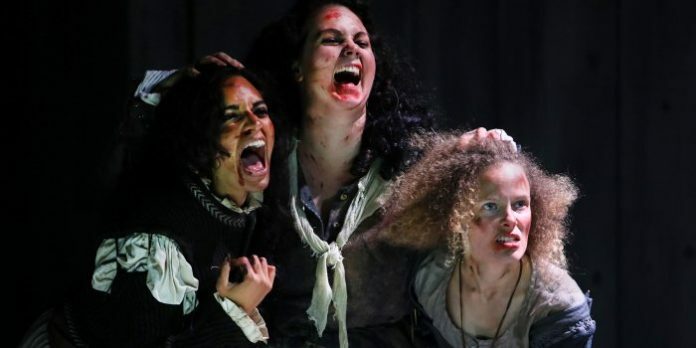 Some of the battle scenes with the stage full of actors seemed a bit undercooked and chaotic, but the bloody scenes are well done with Lady Macbeth’s hands dripping red, the witches smearing blood on their mouths, and a severed head to finish things off. The thought that he is destined for greatness propels Macbeth to seek it out in any way he can, even if that means committing murder. The more the witches’ prophecies come true, the more he is convinced that he must become king. As Lady Macbeth cajoles him and helps him to carry out her bloody scheme, we are asked to question whether Macbeth is culpable or if he is forcibly led down this path of self-destruction. O’Connell and Carlson embody this well, and as they plot to kill the king seem almost aroused by the thought. Although the drumming could have been toned down, some of the other sonic elements amplified the horror of it all. Lady Macbeth’s chilling screams, the witches’ evil laughs, and swords banging on the stage all added to the ominous atmosphere. Overall, this is a strong production that reminds us that free will can be manipulated and not all prophecies need to be fulfilled.